The league returned this past weekend and while the results at the top of the table were predictable, the bottom sides showed some fight in their battle to avoid relegation. The Division 1 Féminine returned last weekend after almost a month of inaction due to the international break and teams participating in the Coup de France Féminine. A miserable campaign saw some sunlight as Lille OSC stopped losing streak with a six-goal thriller against En Avant de Guingamp. Guingamp went ahead first as Louise Fleury was found open out wide and she headed into the penalty area before cutting inside and finishing low past the goalkeeper in the fourth minute. Léa Le Garrec then put the visitors up by two five minutes later when an awful back pass by the goalkeeper was intercepted and then moved quickly to set up Le Garrec with a straight forward shot on goal. Fleury was back amongst the goal at the end of the first half as Le Garrec played Fleury through and the forward rounded the goalkeeper to make it three for Guingamp. Many could have been forgiven for thinking the game was done but the half-time break was exactly what Lille needed to regain a foothold in the match. Not long after the second half started, Hanna Diaz capitalised on some confusion between the goalkeeper and a defender to score Lille's first of the game. Diaz then made it 2-3 to the hosts in the 67th minute when she was on hand to nod home a great cut back by Marine Dafeur. With the clock winding down, Lina Boussaha tied the game up after being in the right spot to pick up the second ball from a corner kick. Lille remain in the bottom two spots of the table but with this sort of come back, they may have finally found something to hold on to and help them push themselves further up the table. They are only four points from safety and with points still to play for, they can take heart from their second half performance. Guingamp remain in seventh after this weekend and will be disappointed with how easily they folded in the second half from a commanding lead. They are eight points clear of the relegation zone but will not want a repeat of this weekend any time soon. The other relegation battlers, Rodez AF may not have had the amount of goals that the above match provided but at this stage of the season, they will welcome points no matter where they come from. Rodez travelled to face FC Fleury 91 and came away with a credible draw. There were very little opportunities created in the game but of those created, Rodez had the better of them but failed to convert any of them. Rodez are still not mathematically out of the division yet and three points this weekend was something they desperately needed after losing so many matches in a row. One point may not seem enough now but should it go down to the wire, Rodez may look back at this weekend as a turning point for them. Fleury themselves remain in sixth and will be happy enough with the draw as well after losing their last three matches. Fleury are also nine points above the relegation zone and will want to maintain that lead for the rest of the season. Going into this match up, predictions would have shown that Montpellier HSC would have enough in them to beat FC Metz. Montpellier had struggled in front of goal for most of the season but over the weekend, they rediscovered their clinical finishing and put seven past the hosts. Some early forrays by the away side led to the first goal of the game as Metz never adjusted tactically to stop the onslaught coming their way since the first whistle had blown. Janice Cayman started off the scoring in the 21st minute when she outpaced the backling and got a deflection off of the advancing goalkeeper to finish into an empty net. Sofia Jakobsson made it two in the 29th minute after working her way into the penalty area before sending her effort over the goalkeeper and into the goal. Jakobsson's second in the 33rd minute was a freak goal as her cross from a long way out was carried by the wind over the goalkeeper and into the far corner of the goal. The second half proved to be more of the same as this time, Clarisse Le Bihan got herself on the scoresheet in the 47th minute. Marion Torrent was next up with a goal in the 63rd minute and then Valérie Gauvin made it six in the 67th minute. Anouk Dekker then wrapped up the goals when she converted a corner kick into goal in the 81st minute of the game. Montpellier now sit in fourth and although a long way off of the top two teams, will be happy with putting away one of the struggling teams in the league in a satisfying fashion. Metz remain in tenth place and other results going their way has kept them four points clear of the relegation zone. These are not the matches that Metz will expect to win but the manner in which they conceded the goals will be a concern for their fans. The run away train that is currently Olympique Lyonnais showed no signs of slowing down this weekend as they thumped FC Girondins de Bordeaux by seven goals to one. Shanice van de Sanden opened the scoring in the 14th minute when she was played through on the break by Amandine Henry and the Dutch international finished well past the goalkeeper. Dzsenifer Marozsán made it two in the 21st minute when Bordeaux failed to clear their lines effectively and Marozsán quickly stepped into her shot and finished into the far corner from the top of the box. It was three for the visitors in the 27th minute when Lucy Bronze's cross came off the crossbar and Ada Hegerberg was the first to reach the rebound and score from close range. 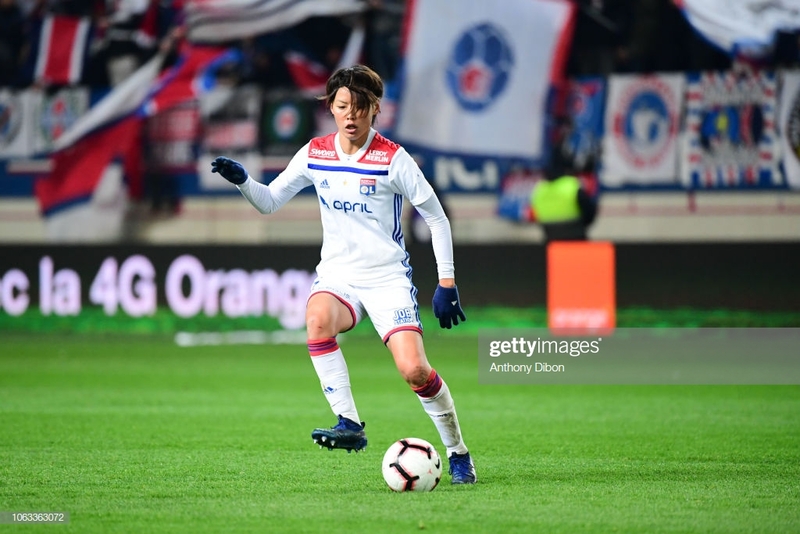 Viviane Asseyi got one back for Bordeaux three minutes later when OL were caught sleeping a little in defense but that was all Bordeaux could muster against the current champions. OL extended their lead in the 48th minute when Henry's shot came off the post and Hegerberg squared the ball to an open Eugénie Le Sommer. Kadeisha Buchanan got on the end of a corner in the 63rd minute at the far post to make it 5-1 to OL, van de Sanden got her brace in the 73rd minute and Hegerberg wrapped things up with her second in the 84th minute. With the way they are playing right now, it may take an almost miracle to stop Olympique Lyonnais from winning yet another league title. Even when they rest players, they still have enough talent in their ranks to defeat most if not all the teams in the league. The only team capable of stopping them now, is themselves. Despite the heavy defeat, Bordeaux remain in fourth and continue on their remarkable season. They will want to bounce back from this performance as quickly as possible though to continue on their good form. Paris Saint-Germain are still right behind the league leaders and although may not have dispatched their opponents as easily, will be happy with the three points all the same. PSG tested Dijon FCO through the game but could not open the scoring early thanks to some great saves by goalkeeper Émmeline Mainguy. It took a long time but PSG's pressure finally told as Aminata Diallo scored an absolute thunderbolt in the 88th minute to put PSG ahead. PSG then made sure of the points when they got their second in stoppage time on the counter. Dijon had pushed forward in search of a goal but a long clearance was chased down by Grace Geyoro who then picked out Sandy Baltimore with a great crossfield pass. Baltimore made her past a marker and then beat Mainguy at her near post, much to the delight of her teammates. After this weekend, only two points separate PSG and OL. The match on April 12th could end up deciding which of the two teams will be the league champions this season but until then, PSG will want to remain in hot pursuit of OL. Paris FC came away from their weekend match frustrated after failing to really get going against ASJ Soyaux. In fact, Soyaux probably had the better of the chances in that 90 minutes plus but they could not get the goal their play deserved. Paris is mathematically safe from relegation but a team of their stature will not be happy with wallowing in fifth, 25 points behind PSG in second. Matches like this are the reason why Paris are so far off the top and that will need to be addressed this summer if they want to make it into continental competitions again. Soyaux are six points off the bottom in ninth and will be relatively pleased with their performance this weekend. A few more wins here and there and they should also safely keep their place in the first division for next season.